Oh baby it's cold outside...well, this fabulous soup will warm you up in no time at all! Heat the oil in a large saucepan over a medium heat. Add the onion and garlic and cook for 1 to 2 minutes, until softened. Add the ginger and curry paste and cook for 1 minute more. Add the sweet potatoes, then pour in the chicken stock and coconut milk. Bring to the boil and cook for 10 to 15 minutes, until the sweet potatoes are tender. Remove from the heat and purée until the soup is smooth. Add the lime juice and zest. Stir in the lentils and return to the heat for 1 minute, until the lentils are warmed through. 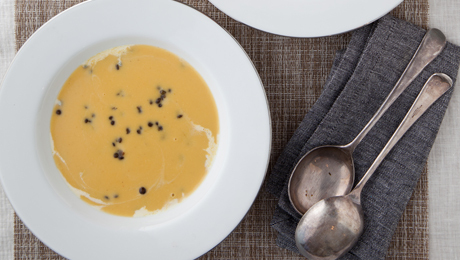 Divide the soup between bowls and drizzle with some cream. Serve with crusty bread. Kevin says: I've used tinned lentils in this recipe, but you can buy them dried and soak them in water instead. The sweet potato can be replaced with butternut squash or pumpkin.